More than $1 million worth of gold that has sat on the floor of the Atlantic for nearly 300 years has finally resurfaced, thanks to a team of Florida treasure hunters. The 60 gold artifacts were brought to the surface nearly 300 years after the treasure sank to the bottom of the ocean floor off of Florida’s Atlantic coast on July 31, 1715. 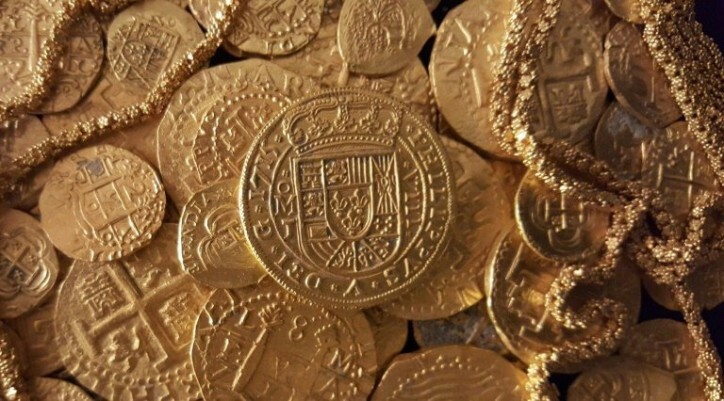 The find from the Spanish shipwreck includes 51 gold coins, 12 meters (40 feet) of ornate gold chain and a single coin called a Royal that was made for then King Felipe V.
According to Brent Brisben of 1715 Fleet - Queens Jewels LLC, the latter is the most important piece of all because it is so rare. That firm does treasure hunting work and also farms it out, one of its subcontractors is a family called the Schmitt's. The family of treasure hunters discovered the gold a month ago in shallow waters off the town of Fort Pierce, working the Atlantic from a ship called the Aarrr Booty. The discovery was kept secret until this week so to be announced for the 300th anniversary of the sinking of a fleet of Spanish ships in a hurricane off Florida, in late July of 1715. The vessels were sailing from Cuba to Spain. He added the treasure was in very good condition. According to the company the finding is one of the most amazing recoveries in 1715 Fleet History. “Congratulations to the entire Schmitt family and the crew of the Aarrr Booty," they said in a Facebook post. Spain has recovered much of the sunken treasure after the fleet went down in 1715, but hundreds of thousands of coins remain on the sea bottom. If calculated with a price of $250 per coin, the 1715 Fleet - Queens Jewels LLC estimates that all coins are worth $550 million. The company has made other finds stemming from the 1715 storm. Under Florida law, the state keeps 20 percent of the treasure. The rest of it is shared evenly by the family and the company.